Since childhood,I was brought up on cuisine that was mostly typical of my community and Uttar Pradesh. 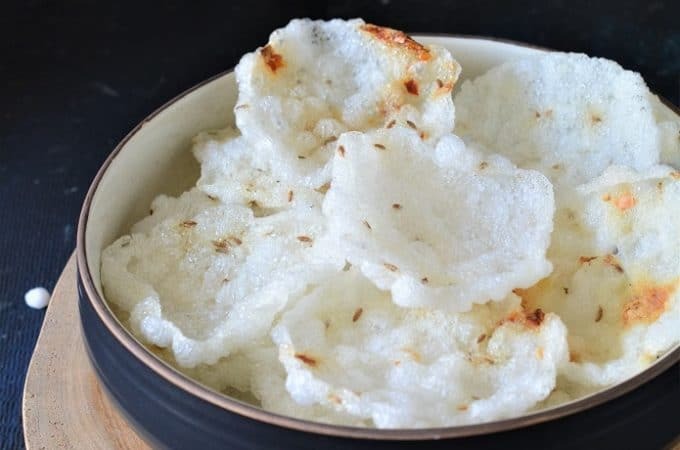 It’s only after coming to Dubai after marriage that I got the opportunity to explore Sindhi, Gujarati and Kutchi Bhatia cuisine and came to love it a lot ! The Bhatias are a community of Sindhis who had migrated from Rajasthan,India to a village Thatta in Sindh,Pakistan,and then had returned during the partition.I absolutely love their food and make most of their recipes pretty often which I learned from some good Bhatia friends of mine .Their one dish that me and my family absolutely adores is Bhatia Kadi. Now for those who’re well familiar with what Kadhi is,are aware that it is usually made from gram flour and yogurt,and may have dumplings or boondis.But the first time I heard the description of Bhatia Kadhi I resolved that I am never going to taste it.Being from Uttar Pradesh,it was impossible for me to digest the idea of Kadhi made of okra,bananas, and chickpeas.But once I had it,it found a regular place on our weekend lunch menu at home and is now a family favorite. 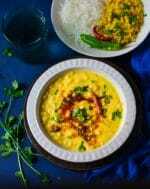 This kadhi is quite different then the other besan kadhi’s you may have tasted. First of all its not heavy like other kadhi which are made only with gram flour and the dumplings are also made with the same gram flour though they are delicious but heavy to digest. Bhatia Kadhi is not only great in taste,but is also a very healthy concoction of vegetables and lentils.Whole green gram is boiled in enough water and then strained and then this strained water is added in the kadhi,which gives it a nice green color,enhances the taste and adds to the nutritional value too. 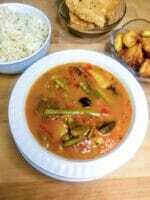 In this Bhatia kadhi only little gram flour is added, the moong water also give some thickness. 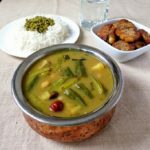 A lot of vegetables are added in the kadhi and is boiled for a quite long time so the vegetable gave a nice taste and flavor to the kadhi. 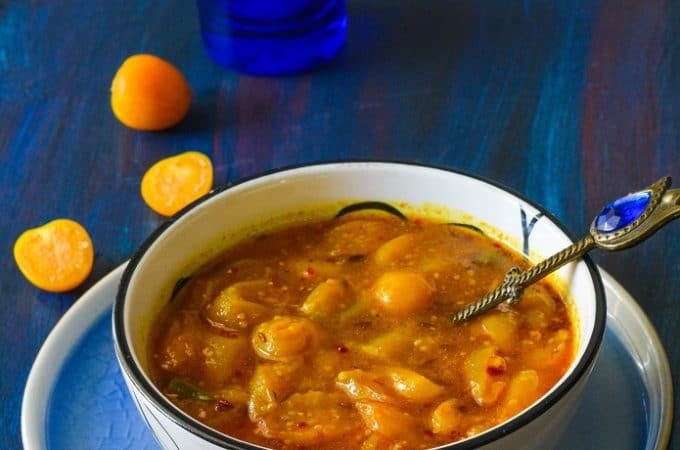 This bhatia kadhi taste sweet and sour due to the addition of tamarind,kokum and little jaggary. 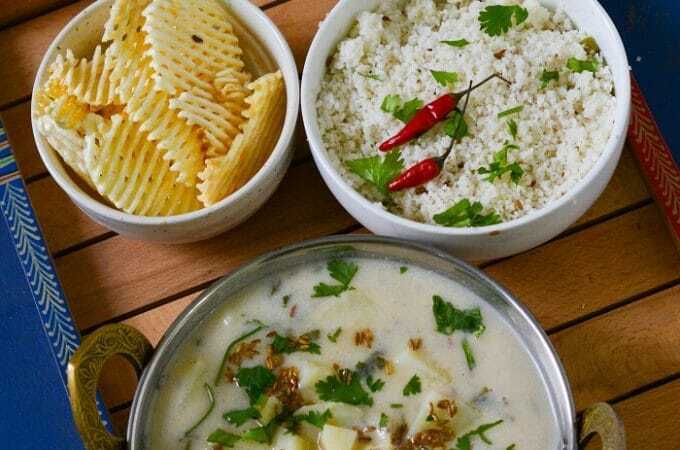 The Kadhi is served with a few side dishes,such as steamed rice,boiled green moong or pureed yellow lentil(Lachko daal),aloo tuk and papad. Do try this Kutchi Bhatia kadhi once and I am sure it will become regular in your kitchen. Wash and soak chick peas and cow peas overnight. 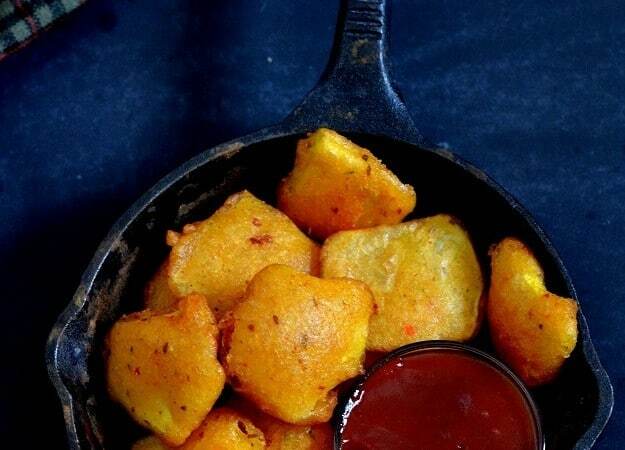 Peel potato and yam and chop into big cubes. Peel and make 2 inch pieces of drumsticks. Destring the cluster beans and chop into 2.5 inch pieces. Trim the ends of okra, slit lengthwise and chop into 2 inch pieces. 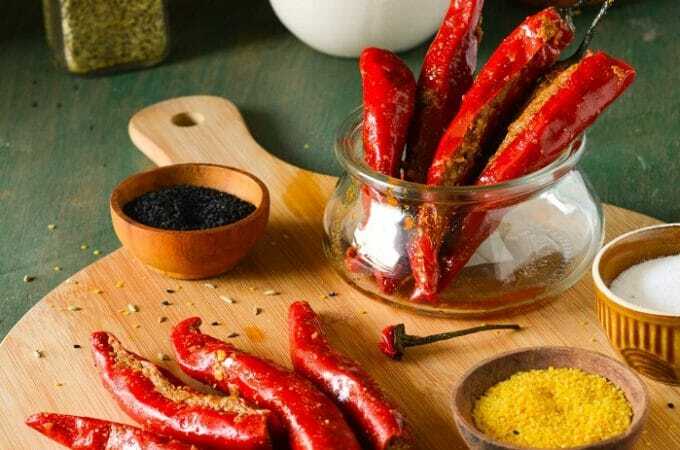 *Use the hot variety of green chilies as red chili powder is not used in the kadhi. Wash and soak green moong in enough water for 1/2 hour. Boil water in a big pan and add moong, curry leaves,chopped green chilies,turmeric,salt and asafoetida. Boil on medium heat. Add some plain water in moong water-A , to make it 5 cups. Take the boiled moong in a heavy bottom pan, add 2 tsp ghee and simmer it for 2-3 minutes. In a big and wide pan add ghee and then add cumin and fenugreek and cook on a low flame. When cumin starts crackling add green chilies, dry red chilies and curry leaves and then add asafoetida. When cumin becomes golden, add cluster beans, chickpeas and cow peas and saute for a minute. Now add the strained moong water, chopped yam, black kokum, brown kokum and ginger. Let it cook on medium heat for around 20 minutes . 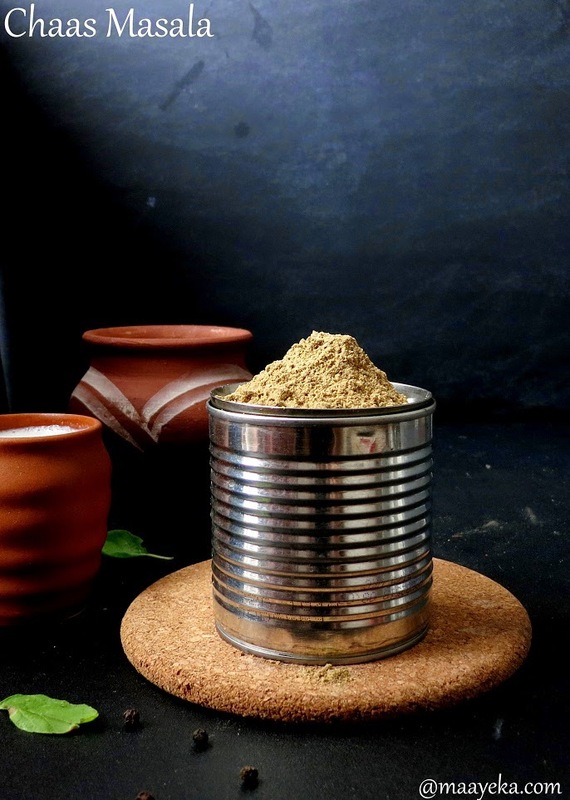 Mix gram flour with 1 cup water and then mix approx 2 litre water in it. Add this gram flour water in the pan, cook for approx 5-8 minutes on high heat till it starts boiling. Keep stirring. Now add drumstick pieces, potato cubes,few curry leaves, turmeric, salt and tamarind pieces. Cook on medium heat for around 40 minutes on medium heat. Now add jaggary, chopped okra, banana pieces and the banana peel. 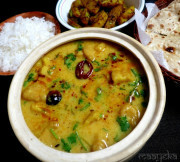 Serving Suggestions - Serve both Kadhi and Moong together with steamed rice, aloo tuk and papad. 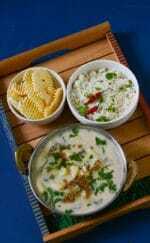 Hi Anjana, I'm a Bhatia & it's really nice to see Bhatia curry and cuisine posted by you. True, as you said similarity between yours and Bhatia cuisine. It needs to boil for 2 to 3 hrs to gve a good taste and color. It's intoxicating and one can have a good noon sleep after eating it. Thank You very much Anjanaji . I'll try to find this in Indian store here. Anjanaji would u please post a click of black kokum and kokum phool too. Sounds interesting, looks different & delicious Kadhi! i'm rising in Gujarat,but this one is totally new for me… must try!!! 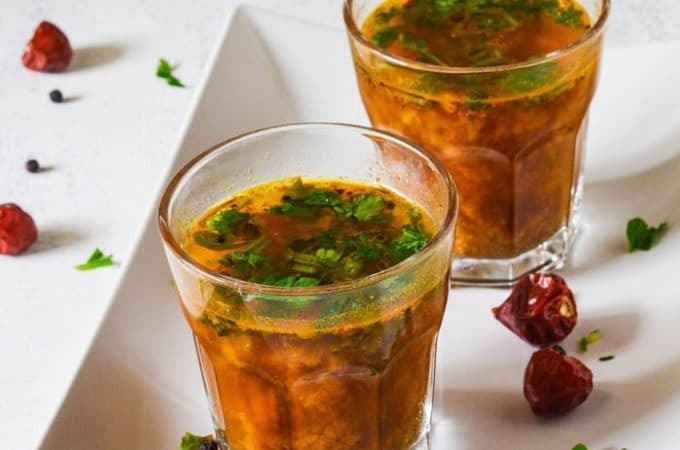 very long list of ingredients dear.. but it would very delicious.. will try it..
lovely spread and delicious looking kadhi…. 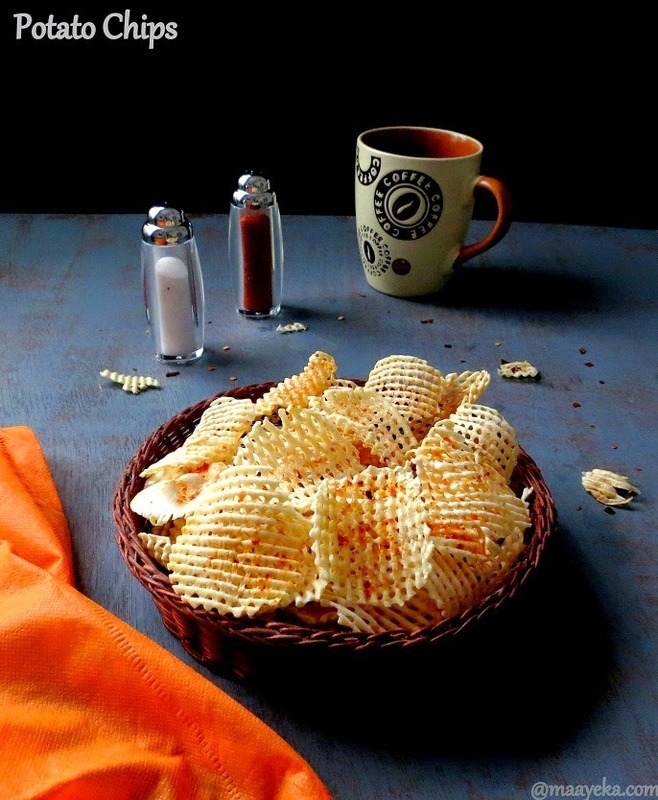 Very new to me…would love to give it a try sometime…looks absolutely yum! Nice kadi, never tried this way. A very comforting kadhi. Looks mild but luscious. Goes well with rice……yummy! Delicious meal.. you have made it perfectly.. 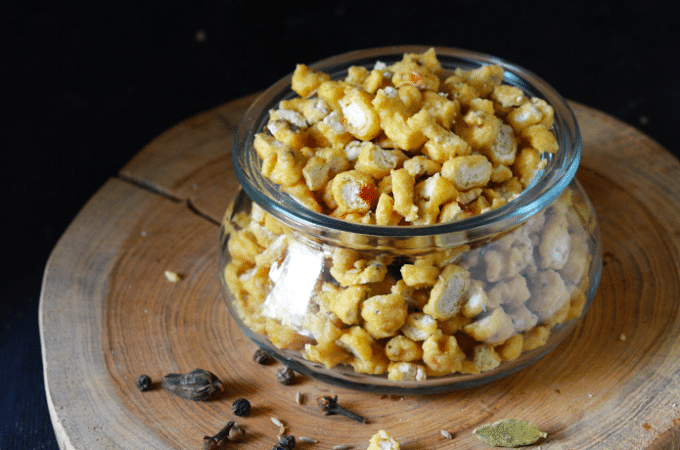 Sounds interesting, different & delicious looking Kadi!